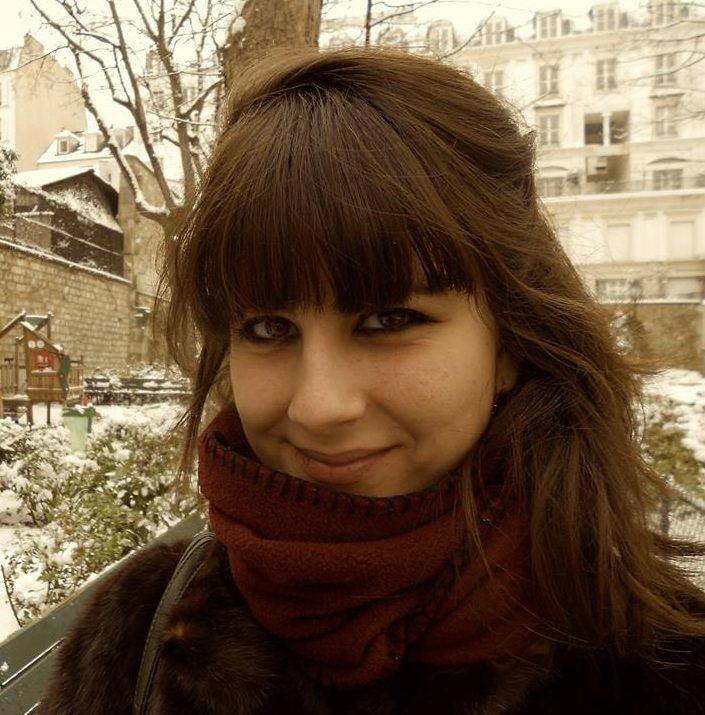 Milena Pavlović is a PhD candidate in Anthropology at LESC, Université Paris Ouest Nanterre La Défense. Her doctoral research focuses on different types of border-ness of Serbian and Albanian inhabitants of Mitrovica. She explores the logics of conflictual interaction that makes Mitrovica a borderland, analyzing the crossing between lived experiences of war and consequent urban, social and biographical trajectories of different generations of the city. Born in Southern Italy from an Italian-Serbian mixed couple, she lives in Paris and she loves ginger, Turkish coffee and paillettes. In the north of Kosovo, close to the Serbian border, lies a city with two names: Kosovska Mitrovica for the Serbians living in its northern neighborhoods, “Mitrovicë” for the Albanians living in the southern ones. The disintegration of Yugoslavia, the violence of the war between the troops directed from Belgrade and the Kosovo Liberation Army in 1998 and 1999, as well as the international military presence after the conflict have shaped the social and political geography of the city. The Ibar river that flows across Mitrovica has become a border separating two spaces of reclaimed national sovereignty, two territorial conceptions, two memories of the past and the war. Just like in the city, the current “ethnic” composition and distribution of the whole country results from violent inter-communal confrontations. The conflict has re-defined the territory through both spontaneous and forced population displacements. Systematic violence in 1998-1999 has not only heavily impacted on the emigration – be it provisory or definitive – of minorities that were on the “wrong” side of the border, but also reconfigured the daily relationships of those staying. Among the first commentaries on my field note, I wrote: “Am I a stranger?”. I felt like an outsider. I felt the eyes of the locals constantly landing on me, in the North as well as in the South. 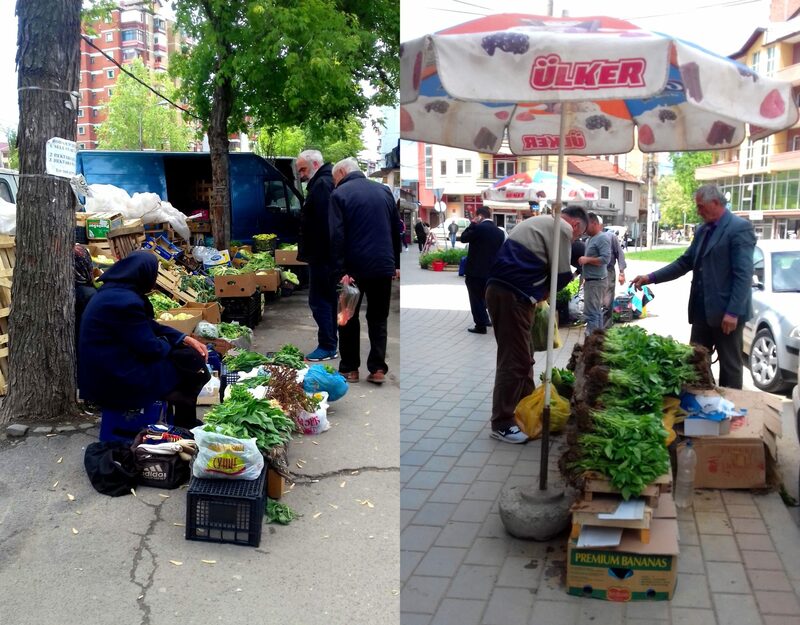 Little by little, I started to understand the logic of the village dimension in Mitrovica. It is important to look at and recognize each other in the street, chatting or sharing a coffee is a daily practice. At the same time, there was my foreigner complex, held inside, convincing myself to be looked at as such. Who was I? Which position did the locals attribute to me as they glanced at me while walking the streets of Mitrovica? Above all, I didn’t want to be considered as an “occidental foreigner” arrived in the city to teach them democracy. There are so many international security forces and NGO volunteers in Mitrovica already, and I wasn’t one of them. I often wished to disappear in anonymity and peacefully wonder about my own subjectivity. Nevertheless, I continued to walk. And I asked the persons I was speaking to if they could join me and share the story of the areas we were crossing together. A crossed experience so to speak. I transformed myself as I was walking the streets and the city transformed itself under my eyes. I took a responsibility for the plurality of my subjectivities being there. I am a curious stranger, I am a Serb from somewhere else in Kosovska Mitrovica, I am an Italian in Mitrovicë, sometimes I am the three of it, sometimes I am even someone else. 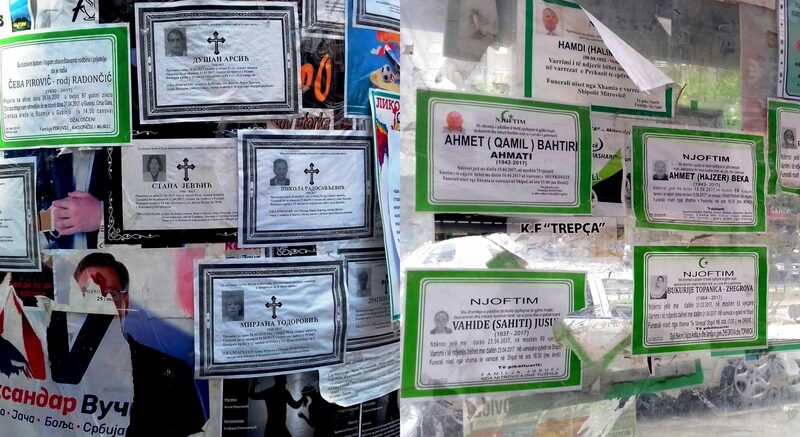 Mitrovica is not an easy city to live, to go through. It isn’t easy to tell its story without surrendering to a simplistic vision or better said di-vision of its space. Rural and urban life coexist in a landscape where daily activities, smells and sounds cannot be firmly located in the North or the South of the city. The socialist buildings and small brick houses succeed one another hidden behind new modern unfinished buildings. The smell of “burek” meets those of Turkish coffees served nonstop. If I lay my eyes toward the North, I can see posters in Serbian Cyrillic alphabet. In the South, on the other side of the Ibar river, I see an Albanian store sign. 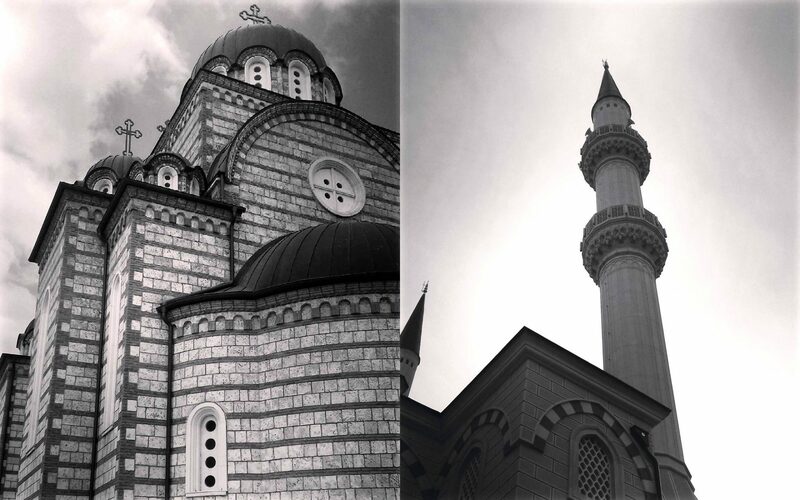 When prayer time comes in the South, the muezzin voice fills the air and invites itself through the window of my room, on the outskirt of North Mitrovica. This city cannot tell one story, not even two, a Serbian and an Albanian. There is a polyphonic story that moves in between, there is a story of the past and a story of a present time shaped by contradictions, negotiations and daily compromises. Carabelli, Giulia (2014): Gdje si? Walking as a Reflexive Practice. In Timothy Shortell, Evrick Brown (Eds. ): Walking in the European city. Quotidian mobility and urban ethnography. London: Routledge, pp. 191–206. Clayer, Nathalie (2013): Kosova. The Building Process of a territory from the Nineteenth to the Twenty-First Century. In Eyal Ginio, Karl Kaser (Eds. ): Ottoman legacies in the contemporary Mediterranean. The Balkans and the Middle East Compared. Jerusalem: The European Forum at the Hebrew University, pp. 79–92. Duijzings, Gerlachlus (2000): Religion and the politics of identity in Kosovo. New York: Columbia University Press. Jansen, Stef (2013): People and things in the ethnography of borders. Materialising the division of Sarajevo. In Social Anthropology 21 (1), pp. 23–37. Jones, Babsi (2007): Sappiano le mie parole di sangue. Milano: Rizzoli. Jović, Dejan (2001): Fear of becoming minority as a motivator of conflict in the former Yugoslavia. In Balkanologie. Revue d’études pluridisciplinaires 5 (1-2), pp. 21–36.